Liquid Syrup Manufacturing Plant is ideal tools for the pharmaceutical industry for the production of Oral Liquids. It is specially designed to take care of two critical factors which directly affect the quality of the Liquids. Minimum manual handling of Liquid and effective cleanness during manufacturing. 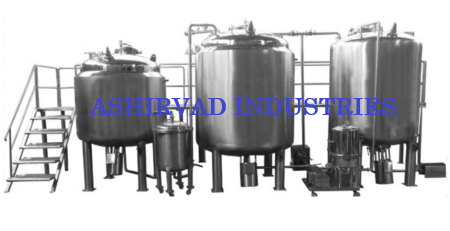 Ashirvad Industries offers Syrup Manufacturing Plants capacity ranges from 500 Litres to 10, 000 Litres. SS. 316 Inline homogenizer with mounting & motor attached. Inlet & Outlet 25 NB with tri clover fittings. Made out from S.S. 304 consisting fuses, voltmeter, terminal, contactor, on/off switches & wiring. Working platform made out of SS 304 Materials top of the platform will be Dimped Pointed Sheet for the safe movement of the operator. Platform will be provided with one staircase Railing made of SS304 will be provided at the border of the platform for safety.